As school budgets are continuously squeezed, head teachers and school leaders are increasingly held to account over each and every penny spent. With this increased focus on scrutiny of budgets, innovative paradigms are often overlooked, which could well be to the detriment of the student experience. Under the old Building Schools for the Future programme, many schools experienced a reduction in outside space, in favour of grand architectural statements such as wide and sprawling corridors. Bizarrely, many of these designs left schools with less classroom space as well as less outside space, in a double whammy to the student experience. A number of methods could be used to bring the balance back to the equation, including the introduction of a fully covered outside classroom, which could be used to provide a peaceful and tranquil space in which to work on a hot summer's day. Many schools have introduced outdoor learning spaces to help engage their students with the great outdoors. This could herald a wider change in priorities, as the exam-based curriculum gives way to a more holistic approach that should foster a lifelong love of learning. 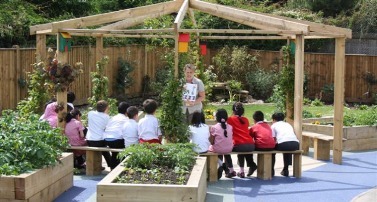 Schools such as Lewes New School, Lewes, have created an outdoor space for learning with great results. Lewes New School's outside classroom space consists of waterproof pods situated in the playground. These so called pods are a cosy and inspiring environment for students to take part in learning activities such as reading, writing or storytelling. This school's pods can accommodate up to 12 students each, with the roofs of the pods being used to grow plants and vegetables, increasing the green-fingered theme of the outdoor learning environment. A school in Doncaster has taken the outdoor learning idea a step further and introduced a facility within its grounds where students can even spend the night camping. Park Primary School has a large and diverse urban catchment area, with many students not necessarily gaining access to, nor becoming engaged by, the great outdoors. The school has done everything in its power to redress this, by investing in transforming a large area of their grounds into an activity centre. The reach of the school's outdoor message is designed to extend past its direct intake and provide a resource for the entire community and other schools, allowing them to discover wildlife and other outdoor activities. The centrepiece of the development at Park Primary School is the overnight camping centre, where students can learn to pitch tents, cook for themselves and learn survival skills, whilst getting close to nature. Park Primary teacher Mrs Fagg explained the school's rationale behind the centre, saying that it was a very diverse area and there was a need to bring the communities together. In these times of increased scrutiny from inspectors and the government, it is refreshing to learn that some schools are putting the educational experience of both their students and the wider community ahead of the simple baseline measures against which all schools are assessed. AUTHOR BIO: Diyana Lobo has written many articles about educational subjects such as the benefits of the fully customisable outside classroom. When she is not writing, Diyana can often be found working away at her allotment, getting herself close to nature.